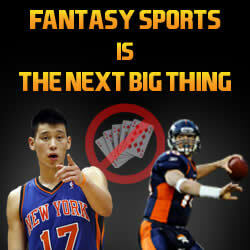 Forget Online Poker - Daily Fantasy Sports Is The NEXT BIG THING! Forget Online Poker...Daily Fantasy Sports is THE NEXT BIG THING! Many have no memory of Online Poker not being as big as it is today, but until about the end of the 1990’s Poker was simply a game played between friends, in casinos or underground illegal poker clubs in every city in the country. Fast forward to today and Poker is one of the top 5 most watched sports on television and one of the biggest real money games online. With the U.S. government shutdown of popular poker sites such as Full Tilt Poker and UB.com as well as some sportsbooks, Poker has taken a back seat to a new emerging game being played on the internet… Daily Fantasy Sports. Fantasy sports have been around long before the internet had even existed with office fantasy pools and other season long league fantasy games but a new and exciting fantasy game has emerged which will be the next big thing - Daily Fantasy Sports. 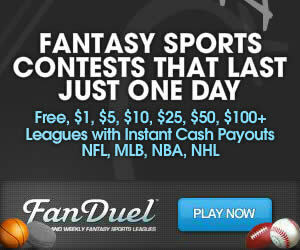 Daily fantasy games take the average yearlong fantasy pool and condense it into one day, or one weekend. They allow you to not have to invest into a full season of games that can be over by the 1st month with injuries or a poorly drafted team. Why are daily fantasy sports games becoming so popular? ...because they are 100% legal! Unlike the crackdown on Poker and Sports Betting sites, Daily Fantasy Sports sites aren’t going to be shut down by the FBI as they have been ruled to be a game of skill according to the UIGEA in 2006, thus not considered gambling. No more worrying about getting your winnings back or whether or not these fantasy sites will survive long term - daily fantasy sports games are here to stay. Even more convenient is the ability to use your credit card or PayPal worry-free to deposit cash to play. What Daily fantasy Sports games can You play? All of your favorites and some that you would never even have considered. Yes, Daily Fantasy Sports sites have something for everyone and for those that like to be on the ground floor of a new thing, this is it! Don’t believe it? Bookmark this page to your favorites, like us on Facebook or follow us on Twitter and watch as we keep you updated on how Daily Fantasy Sports continues to grow and how the early players are making more and more money playing fantasy sports for real money. For a complete list of sites offering Daily Fantasy Sports games for Real Money, check out our site reviews.